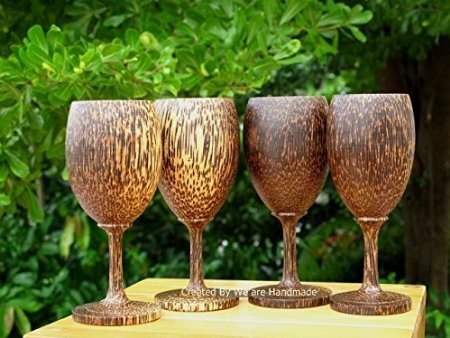 These are the set 4 pieces Fantastic of Handmade Wooden Wine Glasses With Palm Wood Original Designed by "We are Handmade". They have high Quality Unvarnished and Polish Smooth with food-safe finish. This premium items are both beautiful and intricate in the level of detail and is approximately : Diameter 2 inches, 6 inches high (Small Size). Each is completely handmade of renewable farmed Palm Wood (not cnc machine). ! !Moreover If you are finding a gift to somebody!! !! !This is a perfect and handmade gift to give somebody to celebrate their Birthdays,Weddings,New Years, Bon Voyage Gift,Christmas, Anniversary,Housewarming,or all special occasions, or any celebration gift you can think of!!! This product is also unique since it is made to order, producing after order within 5 days. please leave a review and let us know about your experience with our products (We are Handmade's product). Top Diameter 2 inches, Middle Diameter 3 inches, 6 inches high. This is a perfect and handmade gift to give somebody to celebrate their Birthdays,Weddings,New Years, Thanksgiving Day , Christmas or decoration stuff.